ad Rodgers was made for me… I don’t mean literally. I mean that it was made to appeal to my demographic. Gamers who grew up on the PC platformers like Commander Keen, Jazz Jackrabbit, console tiles like Conker or Amiga platformer Ruff N’ Tumble. Drawing inspiration from all those games (and, it has to be said almost lifting Renegade’s Ruff N’ Tumble wholesale visually!) and layering in a foul mouthed sidekick (a la Conker) voiced by John St. John (Duke Nukem). 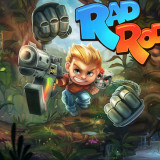 Rad Rodgers started life as a Kickstarter project for developer Interceptor Entertainment but quickly picked up interest from PC stalwarts 3D Realms. You tackle seperate levels as Rad with the help of Dusty, the mechanical counterpart that attaches to your backpack. Controls are simple, run, jump, ground pound with Dusty and shoot varying weapons in all directions using the right stick and the trigger button. Movement feels good. 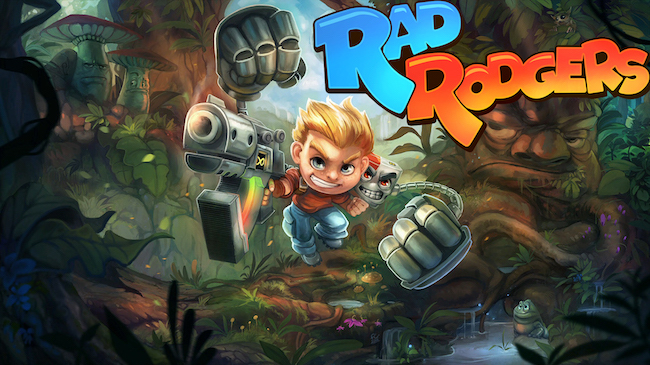 Rad is weighty and solid, but feels similar to how those games it draws from felt back in the day. Despite not being as powerful as they look and feel the games weapons are super satisfying to use with the force feedback triggers offering a good jolt. Each level sees you trying to locate the parts of an artifact that opens the level gate, thus allowing progression to the next level. These start out reasonably small affairs for the first coupe but soon before increasingly large and sprawling levels. So much so that often they feel like they maybe should’ve been split into two separate levels. This is compounded at points by some unclear sign posting on what areas are accessible or that a surface is climeable (often using Dusty to grip a pole or sheer surface). This can lead to some frustration and a long level turning in to a huge chore. 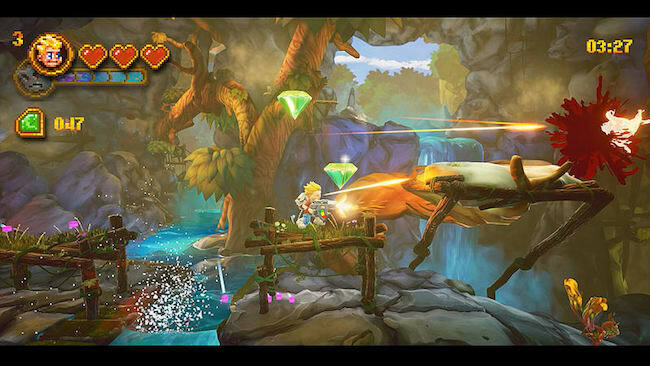 Visually that game looks colourful and bright with a good turn of speed. Some slight judder and a lot of screen tearing really do bring the overall look and feel of the game down though – you really want this to be buttery smooth throughout and even on the One X it wasn’t. Great animation, good environments, but once you’ve seen one or two of the levels they are all very similar – this is just World One after all I suppose yet variety is lacking, especially in enemies. 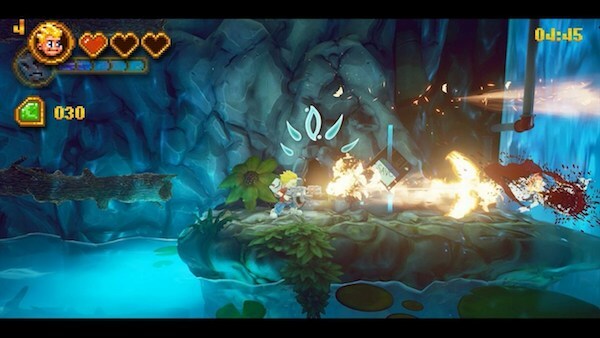 The other big aspect that Rad Rodgers hangs its hat on is the comedy of the playable duo (Dusty is playable at times in mini lo-fi pixel areas where you have to join electric nodes or punch object back in to the world from the Pixelverse). This is mostly made up of one liners and general ragging on videogame tropes. You can turn off the foul language via an options toggle and to be honest it makes little difference to the overall game. The comedy is firmly in the area of toilet humour to the level of if you find someone just using an expletive amusing then you’re the intended audience – others might just find if bearable at best. 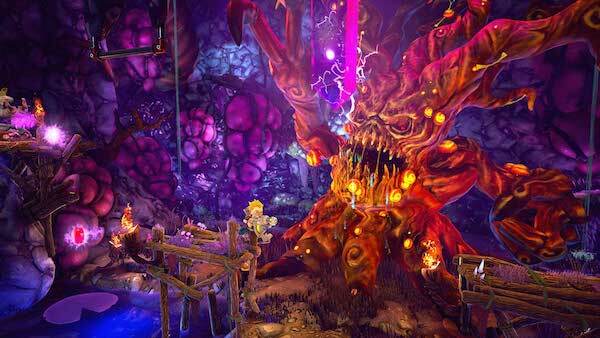 Rad Rodgers is loud, brash and explosive in most of the right places and can really feel satisfying at times to play. A few rough edges around the smoothness of the game and the slight missteps in level design stop it reaching anything more than an enjoyable mindless nostalgia romp. It does what it sets out to do and captures the look and feel of that genre and time very well – it also captures the issues it had too with the game being short on longevity and susceptible to repetition. See what I mean about Ruff….